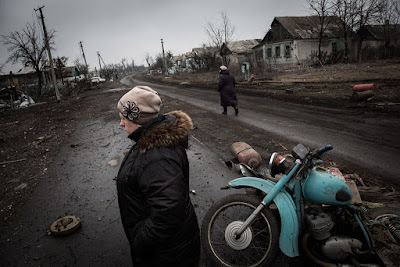 UNITED NATIONS, USA -- The humanitarian crisis in Ukraine is continuing to deteriorate as the number of Ukrainians in need of assistance has now reached a total of five million people, a spokesperson for the United Nations relief arm reported today. Residents walk along the main road of Nikishino village in eastern Ukraine. Addressing a press briefing held earlier this morning in Geneva, Jens Laerke, of the UN Office for the Coordination of Humanitarian Affairs (OCHA), told reporters that almost 1.4 million people were internally displaced while another 3 million remained in non-government controlled areas. Both groups, he said were prioritized for humanitarian aid. Despite the ongoing fighting, Mr Laerke also noted that humanitarian partners in Ukraine had already provided aid for more than 450,000 people this year, including food, emergency shelter, non-food items, medical consultations, nutrition and psychosocial support to children as well as emergency cash grants. At the same time, he said, the UN World Food Programme (WFP) had recently announced plans to scale up emergency food assistance efforts in order to reach 500,000 conflict-affected people until the end of the year. This would require, however, the ability to traverse crossing points into non-government controlled areas, the OCHA spokesperson added. Mr. Laerke further warned that funding of UN aid operations remained a concern with only 35 per cent of the total $316 million dollars requested having been received. The severity of the funding shortfall's impact is slated to grow as Ukraine's short summer turns into winter, exacerbating the needs of the country's most vulnerable people. In late February 2014, the situation in Ukraine transcended what was initially seen as an internal Ukrainian political crisis into violent clashes in parts of the country, later reaching full-scale conflict in the east. Nevertheless, despite a September 2014 cease-fire agreed in Minsk, the fighting has since continuously deteriorated, with serious consequences for the country's unity, territorial integrity and stability.